Forget the connected home and the connected car, this year is all about the connected human and right at the heart of this tech revolution is a gym bag full of fitness wearables that want to make you, yes you, a better human being. From heart rate monitoring headphones to belts that clocks your waist as it expands during the day, 2015 is the year where our tech is smart enough to track more than just our steps. But as technology finds a new market to conquer and brands battle to out fitness tech each other, how much of what we’re being offered is genuinely innovative and more importantly, useful. Wareable’s fitness tech expert Kieran Alger takes us through the hits, misses and maybes from a week of the latest fitness wearables launches. We’ve long lusted after Parrot’s lovely headphones but we’d never considered using them in the gym. That’s all changed with the Zik Sport headset, a new version of the stylish on-ear headphones with extra tracking skills. These lightweight 75g, wireless Bluetooth 4.0 headband-style headphones offer voice calling via microphones and app-controlled noise cancelling but the real innovation is their ability to track your run using 'intra-auricular biometric sensors’. That’s a fancy way of saying 'in your ears'. What you get is pedometery, heart rate monitoring (just like the Jabra Sport Pulse) and some great running dynamics we’re more used to seeing the likes of the Garmin Forerunner range such as ground contact time, cadence and vertical oscillation. What does that all mean? Your running style can be tracked, analysed and hopefully improved using the partnering slick Parrot Zik Sport app. The idea of combining the need to have the Rocky theme tune powering your workout with run tracking in a set of headphones seems like a smart idea on the surface. That is, until the moment when you don’t want to, or can’t (some races ban headphones) run with headphones. Then your tracking is gone. Casual runners might like these but there’s a waft of gimmickry that’ll alienate personal best chasers. Garmin has been busy of late. In addition to the range-topping Forerunner 920XT they’ve launched the Fenix 3 and the updated Vivofit 2. And now the Vivoactive joins the line-up. The Vivoactive is a multi-talented sports tracker with the brains to log running, cycling, swimming and golf, as well as everyday activity tracking. It comes with the colour LCD screen we’re starting to expect on Garmin watches and claims to last up to three weeks in watch/activity mode. That drops to ten hours when you fire up GPS. It’s not just in the range of sports it tracks that makes the Vivoactive stand out, it also connects via Bluetooth to receive notifications from your smartphone. Running can be tracked via GPS or the Vivoactive's accelerometer when running indoors. Meanwhile keen golfers can access up to 38,00 course maps, scorecards and the ability to measure distances using GPS.Two wheel fans get the same GPS stats as well as calories and the swimming app counts lengths, tracks pace and distance and determines your SWOLF swimming efficiency score. You can also connect to third party apps and get more apps from Garmin’s new IQ Connect platform. All that for a mere$250. It’s really pleasing to see a sport watch with a more stylish design that hasn’t scrimped on the tracking smarts. Clearly Garmin’s response to the incursion into their territory from the like of Android Wear and the Apple Watch, the range of tracking on offer here is truly impressive. The design isn’t perfect but having one watch that sit as comfortably with the crisp cuff of your work shirt as it does with the sleeve of your base layer is definitely where the market is heading. The more affordable younger sibling to the Withings Activité, the Withings Activité Pop features the same functionality but has been hewn from cheaper materials to make it more affordable. Despite it’s cheaper build, you can’t ignore the style here. It’s slick looks come in three colours, azure, shark grey, and sand. Behind the beautiful facade, you get fitness and sleep tracking and the ability to pair all your data with the very capable Withings HealthMate app. The tracking is subtly integrate into its classic watch face. A simple0-100 dial reports your progression towards their daily goals. There’s a battery that Withings claim will run for an estimated 8 months. It’s also waterproof to 30m so your tracking doesn’t have to stop at the side of the pool or in fact when you step into the shower.It’s pegged for $149.95 in the States, £119.95. Beautiful as it is the Withings Activité Pop does strike me as a wearable lacking any real fitness depth. With no GPS tracking it’s not going to replace your sport watch. Long term that’s going to be a problem for Withings as the likes of Garmin, Apple, Polar, Android and everyone else starts to offer fully featured watches with enough style to match the Pop. Once you’ve logged your food, counted your steps and tracked your sleep, what’s left for the quantified self obsessive? Easy, skin health detection. That’s right, the MySkin OKU skin health sensor uses an optical sensor to analyse the relative state of your epidermis. It sends readings on moisture, oils and even wrinkles back to the partner smartphone app which then offers helpful advice on how to get extra glow into your outer layer. It’s fitness for your facade coming your way in April 2015. Like a lot of fitness tech, the OKU will live or die by the value of the advice it offers and that bit we’re yet to see. While we’d all like to have glowing healthy skin, it’s hard to see many people shelling out on a product with such a singular use. Still in Kickstarter mode the Fitguard is designed to help detect concussions and other brain injuries that until now have been tricky to sport in contact sports. A built-in accelerometer and gyroscope tracks linear and angular acceleration and use that data to highlight when a player has suffered a potential concussion-class impact. Teammates are detected to the fact you’ve just taken a battering by lights in the guard, allowing medical attention to be administered. It’s ideal for sports like rugby, American football and ice hockey where big impacts are frequent. With the continuing debate over concussions in football it could have a place there too. Expect Peter Czech to the the first to clamp it onto his choppers. All going well it’ll go on sale in September or October this year. This isn’t the first impact detection wearable we’ve seen. Reebok launched the CheckLight headgear in 2014 designed to solve the same problem. There’s definitely mileage in this kind of diagnostic tech, particularly where clubs will be keen to protect multi million pound investments. Will we see it protecting the Sunday league footballers on Hackney Marshes? Not unless Ronaldo sticks it in his mouth first. Your downward dogging might never be the same if the SmartMat has anything to do with it. Due to ship in September this year, this innovative yoga mat wants to be your very own portable yoga instructor. It looks like any other roll-up yoga mat but underneath its outer foam is a grid of conductive fabric that sits on top of piezo-resistive material that changes its electrical resistance when pressure is applied. This real time pressure sensing technology pairs with a smart mobile interface to monitor your movements and offer instant advice on how you can improve your poses and your posture. It has different modes for when you’re at home or in class. We’ve not had the chance to try out our lotus on this but if it’s genuinely responsive then this could be a big hit. Getting better at yoga requires consistent practice and having useful guidance from the comfort of your own home should have great appeal for the millions of wannabe yogis out there. Genuinely useful. If it works. 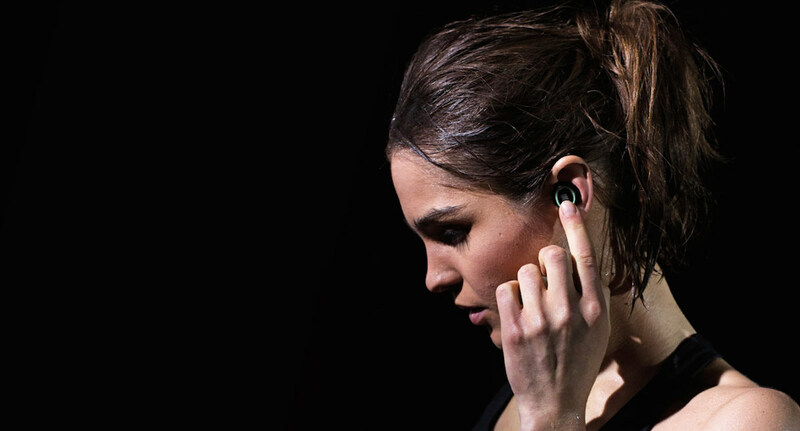 Another gadget in Kickstarter mode, the Bragi dash earbud, MP4 music player and waterproof heart rate monitoring fitness tracker bagged a CES Innovation Award. A bit like the earpiece the Joaquim Phoenix’s character uses to conduct his operating system love affair in the film Her, they're wireless in-ear buds from the future. The Dash can play music from the built-in storage or stream it via Bluetooth from any app on your smartphone and they work much like the Jabra Pulse to fire extra fitness data to the partner app.They’re available for pre-order for $299 and are pitched to start shipping in April. What we said earlier about the Parrot Zik fitness headphones is also true here. The problem with fitness tracking headphones of any kind is what happens when you take them out of your ears. Yep, that’s right, no tracking. And what people who track their movement, running and heart rate hate more than anything else is gaps in data. We’ve all looked down and thought maybe we should loosen that strap of leather that’s supposed to be keeping our trousers up a notch. Well Belty is the new wearable tech answer to feeling squeezed round the middle. This is a smart belt that tells you when your waist is expanding (and presumably shrinking) and can loosen and tighten automatically thanks to a series of built-in sensors. On top of that it’ll also act as a pedometer and alert you when you’ve sitting down for too long. All of the info is synced wirelessly to your smartphone so you can check on how you’re doing. Do we really need a belt to tell us our belly’s on the big side? Of all the items that we’ll see starting to sport clever sensors, I think this is one least likely to take off. We’ve seen products like the Lumo Back stir up debates about so-called nag tech, the wearables that want to remind us to be better, but I think it's unlikely that we’ll opt to have our belt nagging us about how out of shape we are. Not to mention that right now this is one ugly looking accessory as well. That’ll be the first thing the makers need to work on if it’s to ever stand a chance. Essentially a wearable Walkman with tracking tricks, the Smart B-Trainer has everything you’d expect to find these days in a good portable music player including Bluetooth, NFC and storage for onboard music playback. But this adapted version of Sony’s music machine comes with added activity tracking intelligence. You get GPS, an accelerometer for step counting and heart rate monitoring in the right earpiece of the headphones. All the data it collects is then synced with your smartphone providing the usual metrics - distance, time, calories. There's audio fitness coaching to keep you motivated and real-time tips on when to speed up or slow down and stay in the right zones for your desired workout. The B-Trainer will even recommend music to match your heart rate. We’ll say it again, heart rate monitoring headphones are good and everything but they have one big built-in flaw, unless they’re in your ears you’re not tracking anything. The idea of tailoring music to your workout in realtime is interesting. It’s been clinically proven that the right kind of music can improve performance for certain workouts but it’s not clear how Sony intends to do this when prototype becomes a reality. The Magellan Echo fit is puts a slightly different spin on the activity tracking wearable in as much as it essentially just puts data from your smartphone’s various fitness apps where you can see it better, namely on your wrist. It’s capable of tracking your steps, distance traveled, sleep and calories burned and Magellan has teamed up with a whole host of popular apps to add extra depth to its usefulness. In no particular order you can dive into data from: AllTrails, Golf Pad, iMobileIntervals, iSmoothRun Pro, Jog Note, MapMyFitness, MapMyHike, MapMyRide, MapMyRun, MayMyWalk, Men’s Health Personal Fitness Trainer, RunKeeper, Strava and Wahoo Fitness. It’s also got an eight month battery life from a regular coin battery. This isn’t the first ‘mirroring’ device we’ve seen from Magellan and while it’s not a game-changer we really like the simple idea of taking all that power in your smartphone that’s normally strapped to your arm where you can’t see it and making it viewable on your wrist.